This page created 20th January 1998, updated 20th April 2009. London Transport? Yes, London Transport! After the war LT obtained the contract to operate services between Central London and the various London Airports (at Heathrow, Croydon and Northolt) on behalf of British European Airways, the nationalised "local" airline. Initially they operated a fleet of Commer Commandoes, with classic "deck and a half" bodies, the rear portion of seating raised above the commodious luggage compartment. These only seated 18 passengers, and the rapidly increasing size of postwar passenger aircraft soon outstripped them. By the early 1950s LT had persuaded BEA to buy a new fleet of coaches, and convinced them that a design based on the forthcoming RF might be rather more expensive in the short term but would be much more long-lived. Park Royal designed a new deck-and-a-half body, but to a mould-breaking shape: the large luggage compartment was still there, with seats above, but now the roof line was continued forwards to give a spacious, modern-feeling cabin. The 4RF4s were recognisably in the RF family, despite the body's coming from Park Royal instead of Metro-Cammell. It was finished in dark grey and dove grey livery, with a white band between, with aluminium bands with burgundy-coloured inserts as lining. 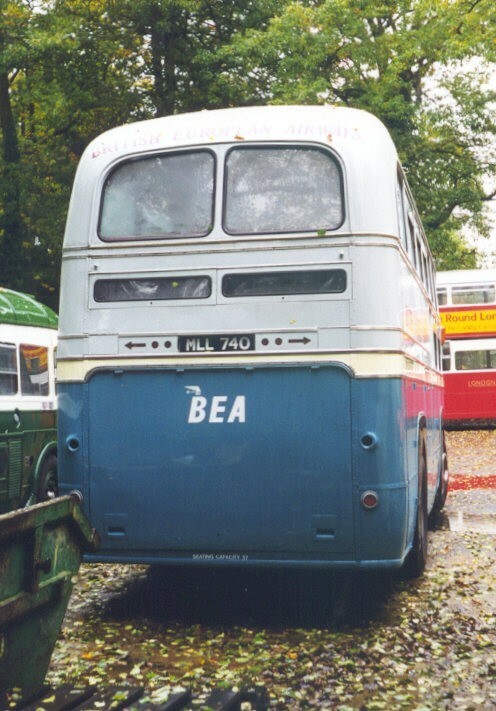 The BEA device was carried as an embossed shield over the radiator filler and on each side. Destination blinds bearing the aircraft flight destination and the flight company (eg BEA or Aer Lingus), gave a touch of exotica to these stylish vehicles. The first batch of 50 arrived between April 1952 and May 1953, and were such a success that a follow-up batch of 15 was ordered. These, identical to the first, arrived between August and October in 1953. The Commer Commandoes were retired, as were the twelve 10T10s that had filled the gap in demand during the building of the new coaches. The coaches settled into their regular shuttles between the new Central Air Terminal at Waterloo Station (Waterloo for Europe in those days too!) and, increasingly, Heathrow. Croydon and Northolt rapidly diminished in status as Heathrow was extended. The coaches were maintained by LT at Victoria garage (GM) initially. In 1957 the London end of their operations shifted to the new purpose-built Air Terminal at Cromwell Road, and their operating base switched to Shepherds Bush Garage. During 1957 and 58 they received their only full overhaul, and emerged in a revised paint-scheme. The trendy dark grey (a business colour) was extended up the sides to just under the windows, and the top became brilliant white. The side coats-of arms disappeared under a more modern blazon: a white panel bearing a red square with BEA on it in white, with the company name in a more up-to-date script. Preserved NLP 645 in the revised livery. Photo, used with permission, by BusSpotter. The fleet was not overworked at the end of the fifties, and some spent several years in store. Others were withdrawn into store each year during the winter months. A change of scene for a few of the coaches came as a few at a time were out-stationed at Reigate (RG) for use on Gatwick services, as that airport took on the mantle of London's second airport. In 1960 the BEA fleet moved again, this time to the redundant trolleybus depot at Hammersmith. By the middle sixties the coaches were approaching double the life-span originally expected of them by BEA, and were being worked much harder. There was more air traffic, and the planes were larger, requiring duplicate coach connectors. The coaches were all in traffic (apart from crash victim MLL742, withdrawn in 1963), and spending only short periods in winter store if at all. 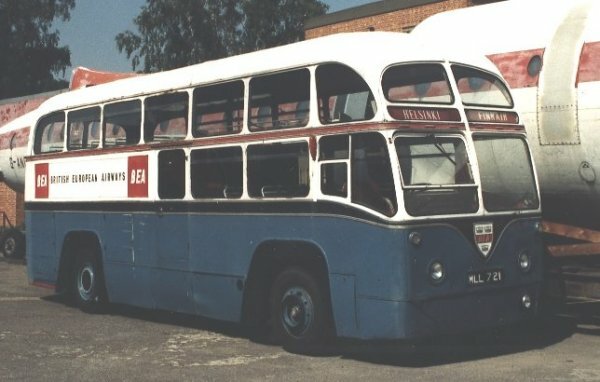 Some of them were repainted into a new livery with dark blue lower panels, white on the top, a black cummerbund and a burgundy stripe (See the photo below of MLL721). In July 1966 they were further relocated to the erstwhile tram depot at Chiswick. BOAC bought some posh new Atlanteans for their airport services. BEA approached LT about replacements for the RFs. Amazingly, LT convinced them to buy Routemasters with trailers! (but that's another story). So the BEA RFs were retired in 1966-7. Except one. 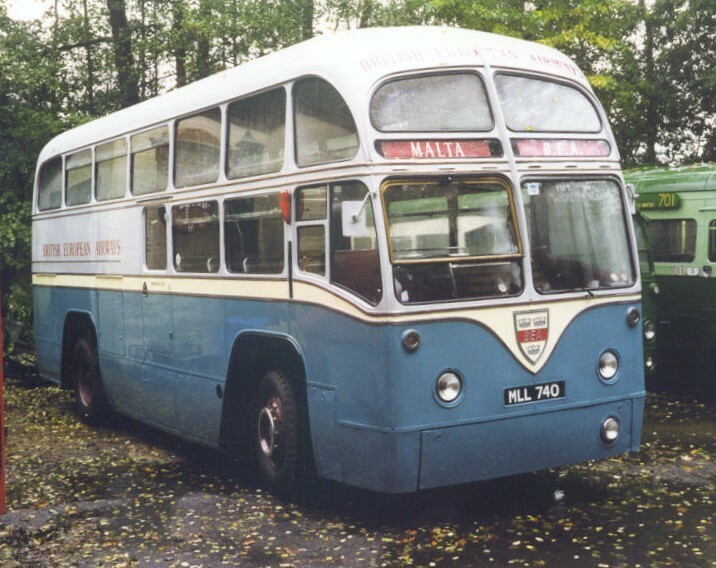 MLL 740 was retained as a spare to the Routemaster fleet, and was repainted in a new livery of tangerine and white. It was also fitted with flashing indicators more suited to the M4 motorway than the original semaphore arms! As such it lasted in service until May 1973, when after twenty years of rushing back and forth between London and Heathrow it was retired. It now resides in preservation, often at the Cobham Bus Museum. Four others were purchased by London Transport, who used them as Mobile Uniform Issuing Units for a further ten years. 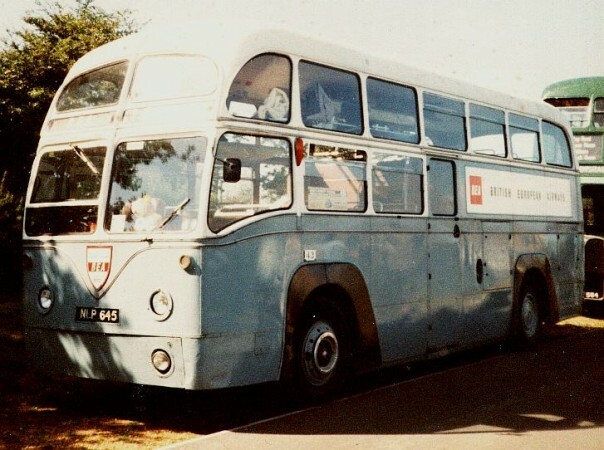 1465W - 1468W had the side windows blanked so that they could be used as changing rooms, while the uniforms were towed in trailers like those provided for the RMAs. One of these (MLL 735), has also been kept for preservation. Photo by Kevin McGowan. Click for larger image. Other BEAs were snapped up by travel companies, and some were soon seen on the roads of Europe actually heading for those exotic destinations on their blinds! Other European travellers were some of the vehicles bought by Yardley's of London as mobile cosmetics showrooms. These were sent to Frankfurt, West Berlin and Milan, before returning home for further careers catering to the film industry. Not many returned to public service, although Margo's of Croydon had some for a short while. Others went to Scout troops, pop groups, travellers and caravanners, and as showrooms, workshops and racing car transporters. Details, sightings, photos... all welcome! 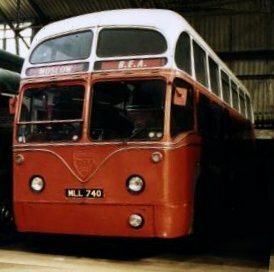 MLL 740, at Cobham Bus Museum. MLL 740 at Cobham in its final service livery. Photo, used by permission, by Kevin McGowan.